As with all GCL enclosures, we only use heavy duty materials to assure strength and durability. -1000 denier Cordura® nylon camo with Polyurethane coating. -30 gauge Aqua-View Smoked vinyl. 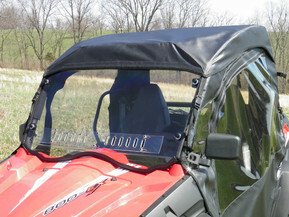 -Heavy duty automotive windshield molding. Premium materials equals premium enclosures that last. Don't settle for inferior products.